Derided at the time of release as an inferior Alien knockoff (despite strong box office grosses), John McTiernan's Predator has eventually grown in stature over the years and is now regarded as an action classic in its own right. The story of a group of commandos on a rescue mission in Central America who find themselves stalked by an alien warrior, it's also one of Arnold Schwarzenegger's greatest, most intelligent efforts, and you don't often see that word associated with the Austrian lunkhead. Of course what everyone remembers are the cornball clichés (Ol' Painless/Get to da chopper), spewed from the mouths of an impossibly macho cast of 80s tough nuts (several of which, ironically, have gone on to successful political careers, including of course the Governator himself). But there is so much more to the film than a cheesy whiff of nostalgia. For one, the director's terrific use of tension (built relentlessly via those wonderful heat signature POV shots) lends Predator a genuinely frightening edge, the cast’s immersion in the sweaty jungle settings so authentic, the sweat virtually pours off the screen. More fascinating though is how it plays against Arnie's crude iconography in the latter stages, stripping him of all weapons and forcing him to take on the creature hand-to-hand, Heart of Darkness style (the evocation of which surely is a sign of brains). Keeping a tight rein on proceedings is Alan Silvestri's blistering score. McTiernan's signing of the composer was inspired, Silvestri's vigorously robust orchestral approach having been laid down in Back to the Future. 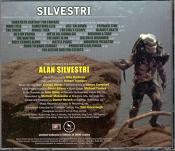 Predator of course was a different kettle of fish, forcing Silvestri to broaden his orchestral and percussive palate. In the end, the director fiddled with the score extensively in the film (as he would with Michael Kamen's work on Die Hard, a year later) but there's no denying its effectiveness, a wonderfully old fashioned mood builder that galvanized the action genre through the liberal mixture of jungle drums and punchy orchestra. The iconic Main Theme for terse rattles, percussion and jabbing brass opens the album, preceded in fact by the eerie piece for the Predator itself, a simple progression on four notes, carried often by winds and strings that maintain a suitably otherworldly air. Main Title lays down these competing elements, the exciting central march playing to the machismo of the heroes, while the Predator theme creeps up and breathes down our neck. These ideas are to be continued and developed throughout the rest of the score, the sense of urgency and desperation understandably increasing later on. Tracks such as The Chopper and Payback Time brilliantly reflect the jungly setting with light percussive tapping dipping in and out of Silvestri's aggressive outbursts. The dynamic musical backdrop seems to punch its way through the soundscape as the characters do with the undergrowth, occasionally calming to reflect the eerily silent all seeing eye of the Predator itself watching from the trees. Throughout, Silvestri maintains a wonderfully propulsive sense of movement, even in slow-burning tracks like Preparing Camp Attack where the rhythmic focus is passed around carefully between different aspects of the orchestra. Occasional music stingers like out of a horror film well match the viewer's initial terror at seeing the Predator emerge on-screen (First Strike). Interestingly, as the score progresses, the exotic elements are gradually dropped in favour of a more primal, conventionally orchestral sound mirroring the changing dynamics of hunter and hunted. As the sense of fraught action increases (brilliant cues like Jungle Trek and Pig Alarm employ a fantastically brutal sense of momentum), Silvestri continues to pepper his music with little nuances. Goodbye and Mac on Watch for example feature moving trumpet solos while the piping winds in 'Anytime' lure the listener to an inevitable doom, doom which erupts in palpably dramatic tracks like Billy and The Chase. 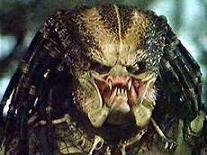 Moving towards the conclusion, Silvestri maintains a gripping blend of slow-burning terror (the groaning Camouflaged as the Predator misses a mud caked Arnie feet away), heartbeat-style percussion mimicking the pulse of the characters and jungle (Preparations) and riveting action (The Challenge through to Self Destruction). Plus, of course, midway through there's that classic building cue in Predator Unmasked as the monster reveals its hideous visage to Arnie, resulting in the film's most famous quote. Bringing the score to a dramatic close, he brilliantly elevates the on-screen action, adding to the primal sense of barbarity and back to basics simplicity devoid of firearms. 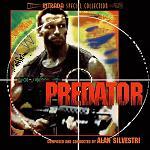 Predator is a landmark effort in Alan Silvestri's canon, an enormous influence on his subsequent action works such as The Abyss and Judge Dredd, as well as works by other composers (John Williams' The Lost World). Although requiring more effort than many action scores due to the extensive range of suspense material, it rewards attention tenfold and adds to the film that extra sense of danger. Silvestri was to brilliantly expand on his original material in Predator 2, and last year John Debney paid the greatest compliment by drawing on the material in his score for Predators. It's the highest compliment one could pay to a classic score. In terms of availability, the score has a spotty release history, and consequently fetches huge prices on the likes of Amazon. A regular release on the bootleg market, in 2003, a Varese Sarabande Club release was limited to 3000 copies. Intrada then released a re-arranged album in 2010, which also sold out pretty much instantly. So good is the score though, it’s worth making the extra effort to seek it out. By contrast, the sequel score is readily available. We suggest you start by checking prices on the Amazon websites using these links for the Varese Sarabance release: Amazon.co.uk and Amazon.com, and these links for the Intrada release: Amazon.co.uk and Amazon.com. Please note that the track listing varies across the different album releases.